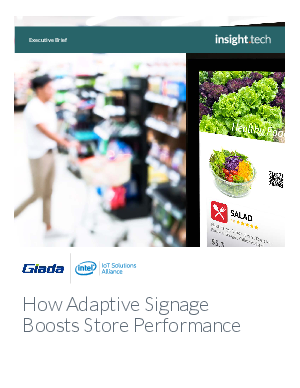 > Research Library > Intel > How Adaptive Signage Boosts Store Performance? Today’s tech savvy consumers are continually driving organizations to deliver a modernized shopping experience. To achieve this, retailers are pushing the edge on developing non-traditional ways in delivering sales messages. One of the best ways to engage shoppers with an in-store digital presence is through modern adaptive signages. Modern signages enable two-way interaction between customers and businesses, tapping onto cutting-edge technologies such as sensors and analytics to respond to customer behavior—helping retailers customize content on the fly. Find out how Giada Technology leveraged on Intel® processors to power up their cloud terminals to pre-process signage, sensor, and mobile data to efficiently exchange information with the cloud. Retailers are better positioned to present contextual promotions to the shoppers, delivering benefits of lesser wait-time and increased customer satisfaction.